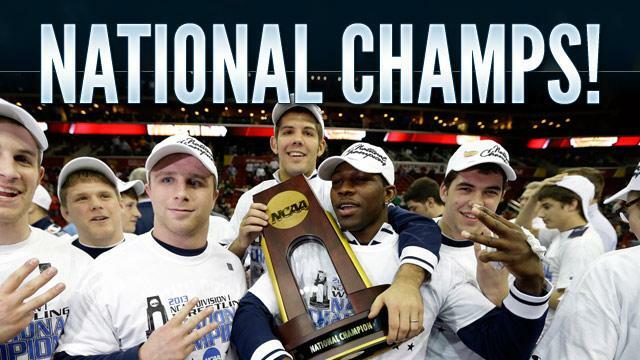 An exciting, and record making, weekend of Division I wrestling was capped off today as Penn St. locked in their third consecutive championship under coach Chael Sanderson. Just keeping ahead of Minnesota, PSU are well on the way to what one could argue is "dynasty" status. Keep in mind on top of the ruthless onslaught, they lose only ONE starter for next year! Can Penn State make it four in a row? 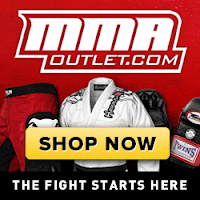 Kyle Dake did. Cornell's rise into the elite levels of collegiate wrestling has to certain degree been founded by perennial grappler Kyle Dake who did not break any records in the 2013 NCAA Wrestling tournament... he made the record! Dake has won four consecutive championships at for different weight classes (141/149/157/165) becoming the only NCAA wrestler to do so. 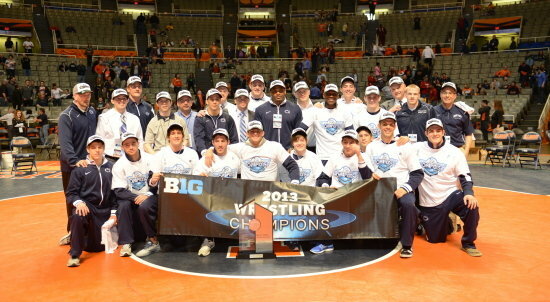 Congrats to Penn State and all the champions for a great season of NCAA Wrestling! A weekend o' wrasslin' with a big congrats going out to the NWJJA team members who fought at the Revolution: Perry / Scotty / Omar / Randy. From the sounds of it you had some killer matches and everyone fought well. While you all were nursing soreness I was relaxing and enjoying the privilege of watching the 2013 Big Ten Wrestling Championships held this year at the University of Illinois. 125#'s: Delgado, a sophomore All American, from Illinois pushed the pace and completely dominated Iowa's McDonough who looked shell shocked after the match. 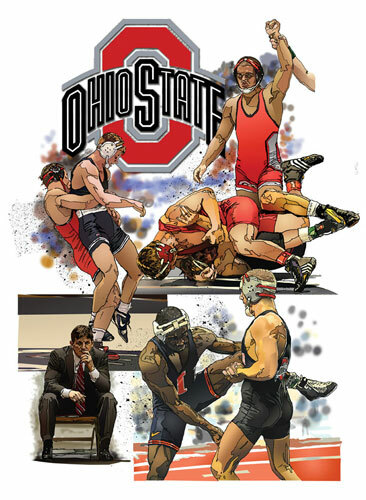 133#'s: The 133 pound championship brought two undefeated records to the table with Ohio State's Logan Stieber fighting Iowa's Tony Ramos. Logan owns the center of the mat and pushes the pace putting Ramos hesitantly on his heels the whole match. Logan secures his second Big Ten title in as many years! 141#'s: Logan's brother Hunter Stieber (of course from Ohio State) brings the same style game to the mat with a bit more muscle. Fighting Mark Balweg from Iowa, Hunter maintains an aggressive game constantly attacking and pestering his opponent. Winning on points the Stieber brothers become the first brothers to win Big Ten titles since the Brand brothers did with Iowa in the early 90's. Some anticipate perhaps dual NCAA titles to the brothers. We shall see. 149#'s: In what was one of the most exciting matches of the day Minnesota's Dylan Ness comes from behind and pins Nebraska's Jake Sueflohn with a beautiful reversal. This is Ness' first Big 10 title! 157#'s: Another come from behind win was mounted by Jason Welch of Northwestern who nails the pin fall on Nebraska's James Green taking home his first Big 10 title as well! 165#'s: Penn State has THE top team in the NCAA right night and David Taylor came out to put a clinic on Conrad Polz of Illinois. Taking his third championship home, Taylor beat up on Polz 9-1! 174#'s: Matt Brown of Penn St. looked a bit slow to get into his rhythm, but he must has smelled the coffee brewing as Brown cleaned house with a 6 point 2nd period (2= takedown / 4=near fall) on Iowa's Mike Evans. For those of you keeping track at home Iowa was shut out in the finals! 184#'s: If you have not heard the name Ed Ruth in college wrestling, well then you have not been paying attention! The Penn St. standout has been nothing short of dominant throughout his career and was named Intermat Wrestler of the Year 2012! With his 6-3 win over Minnesota's Kevin Steinhaus, Ruth amassed an impressive 35-7 point differential over his opponents in the Big 10 Championship alone! 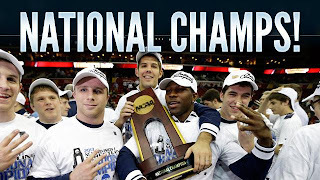 197#'s: The big boys brought some impressive setups and strategy as Penn St.'s Quentin Wright used repeated underhook attempts to get his opponent Scott Schiller (Minnesota) to cease changing levels. Then Wright faked the underhook attempt and shot the double! Beautiful work on his way to securing the 197# title for PSU! Heavyweight: Tony Nelson from Minnesota goes on to win his second Big 10 title over Mike McMullary of Northwestern. Congrats to all wrestlers for a season of hard work and incredible grappling! Here is the official 2011-2012 Ohio State Wrestling schedule. 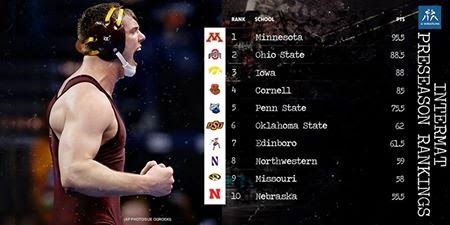 Going to be a tough, but strong year as the pre-season rankings have the team tied at 9th with Illinois, including 4 ranked wrestlers as well! It has been since 1951 that the Buckeyes have tasted Big Ten glory... here's hoping to this being the year!